In addition to coding data on the lawmaking process, students are required to complete a paper analyzing the passage of a “landmark piece” of American legislation. It is our hope that this paper will eventually become part of broader project on American lawmaking and published on a website accessible to the general public. In recent years, scholars of congressional politics have made great strides in generating important new datasets on congressional activity. Consistent with efforts to make congressional politics more transparent, these scholars have made their data available online. However, data alone is likely insufficient for members of the general public interested in congressional lawmaking. Most casual observers of politics are unlikely to download a dataset and analyze it. Making readable landmark bill histories available, however, should aide both scholars and journalists as well as enrich the knowledge of the general public. 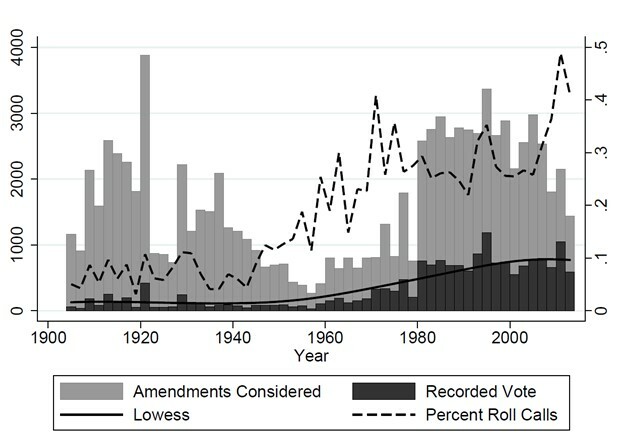 To date, students and faculty have completed over 40 such landmark bill histories. This will be published on a project website in the near future. An example bill history on the National Firearms Act of 1934 is available online. Students have also reported that a number of internships and jobs have inquired about whether they had undergraduate research skills. In this regard, the practical training we provide them with in terms of creating and managing large spreadsheets, mastering Microsoft Excel, writing short reports summarizing their activities and engaging in independent research has proved valuable. Many former students have participated in the University of Georgia's Washington Semester Program. Additionally, they have accepted positions with Governor Andrew Cuomo’s (D-NY) Washington D.C. office, the House Rules Committee, various House and Senate offices, the Podesta Group lobbying firm, Capitol Hill Consulting Group, Ballotpedia and the Georgia State House of Representatives, as well as moved on to top law school programs including Yale, Duke, NYU, Cal-Berkeley, Virginia, Chicago and UGA, Political Science PhD programs including Vanderbilt, UNC, Georgetown and UGA, several Public Administration graduate programs and one became a white-water rafting guide in Montana. We would like to thank all the students that have made this project possible: Haidi Al-Shabrawey, Nathaniel Ament-Stone, Rain Ammons, Whitney Arp, Matthew Baker, Alice Barker, Becca Bennett, Ethan Boldt, Allison Brill, Jason Byers, Maitri Chittidi, Lauren Corbett Bryant, Kasey Clark, Aaron Cooperman, Ananda Costa, Shellea Crochet, Amanda Delaperriere, Michael Evans, Jason Fern, James Floyd, Matthew Fowler, Ryan Freeman, Jacob Frenkel, Catherine Funk, Vinita Gandhi, David Gelman, Sophie Giberga, Kunal Goel, Braden Goodgame, Katherine Graham, Hannah Greenberg, Casey Grippando, Cody Hall, Leyall Harb, Spencer Hardin, Jacquelyn Harms, Sharne Haywood, Daniel Helmick, Cameron Henderson, Rory Hibbler, Kyle Hollimon, Eileen Hong, Nick Howard, Eric Howell, Elise Hynd, Dory Ille, Taylor Johnston, Sydney Juliano, Da Hae Kim, Cody Knapp, Haley Lattke, Maggie Little, Jill Maloney, Caleb Masten, Megan Mayfield, Jordan McKissick, Hayden McRee, Annabel McSpadden, Kayce Mobley, Amber Morgan, Erin Munger, Wes Nichols, Katie Nisbet, Charlotte Norsworthy, Rob Oldham, Landon O’Neal, Tiernan O’Neill, Katie Opacity, Mark Owens, Kevin Parker, Caroline Pearson, Colin Phillips, Justin Pinkerman, Nathan Pinnell, Elaina Polson, Alex Porter, Maribeth Portier, Nathaniel Rice, Scott Riley, Matthew Roberts, Dustin Sammons, Adrien Sandercock, Laine Shay, Melissa Siegel, Joel Sievert, Veselin Simonov, Rob Smalley, Darrian Stacy, Chase Stell, Melissa Strickland, Jessica Suh, Rachel Surminsky, Zach Taylor, Andrew Teal, Kelsey Thomas, Javier Trejo, Katie Umholtz, Abbe Van Gorder, Adam Veale, Michael Watson, Hannah Weiss, Ryan Williamson, Simon Williamson, Andrew Wills, Adam Wittenstein and Sarah Young. Out of over 100 photos, somehow this was the least awkward.